Full of goodness, flavour and taste. 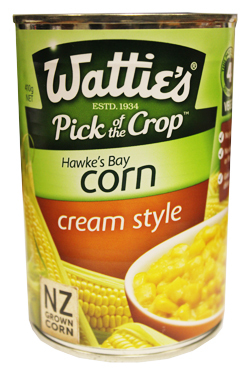 Watties Creamed Corn is made form the finest New Zealand grown corn, sourced from Hawke’s Bay. It is a great source of fibre and contains no preservatives or added colours and flavours. Sweetcorn (80%), Water, Sugar, Maize Thickener (E1414), Salt. Combine the sweet corn, Egg beaten, Salt & Pepper. Sift in flour Baking Powder. Gradually stir well. Cook in tablespoon size fitters. Fry in Butter or oil until Golden Brown & serve. Having just received a can of Wattie's cream style corn I simply had to make a much remembered cheese and creamed corn toasted sandwich. I opened the can to be greeted with yummy, thick, creamed corn. Two toasted sandwiches later, tummy full of NZ sunshine I am happiness filled. Creamy, makes great corn/cheese toasties and corn fritters. Wattie's cream style corn makes the UK offering in the supermarket pale into insignificance.